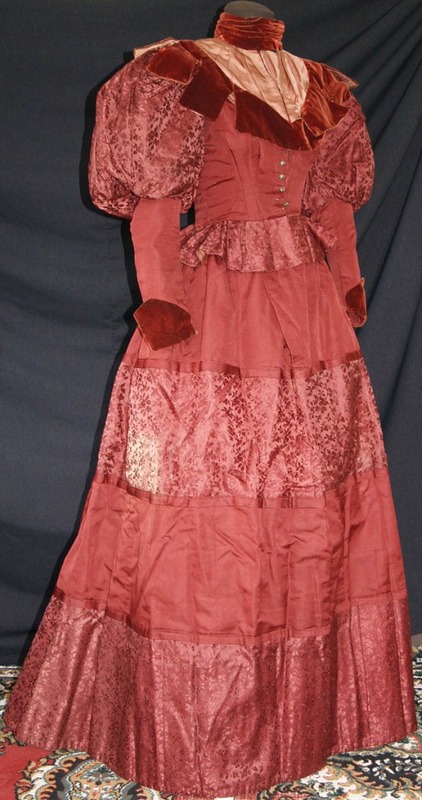 A Rich c.1892 gown is made of the most Stylish combination of colors & fabrics. This Gown was in the Brooklyn Museum Collection & worn by a Socialite, Mrs. George P. Swift, grandmother of Mrs. Henry Crawford who donted it to the museum. 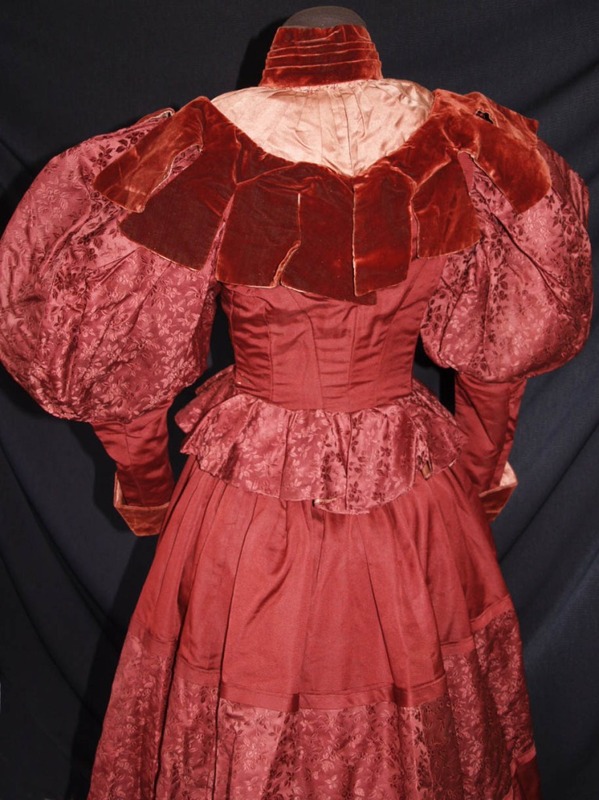 The bodice is made with red borcade Muton sleeves, red silk faille body, burgandy velvet cuffs & salmon satin yoke insert. 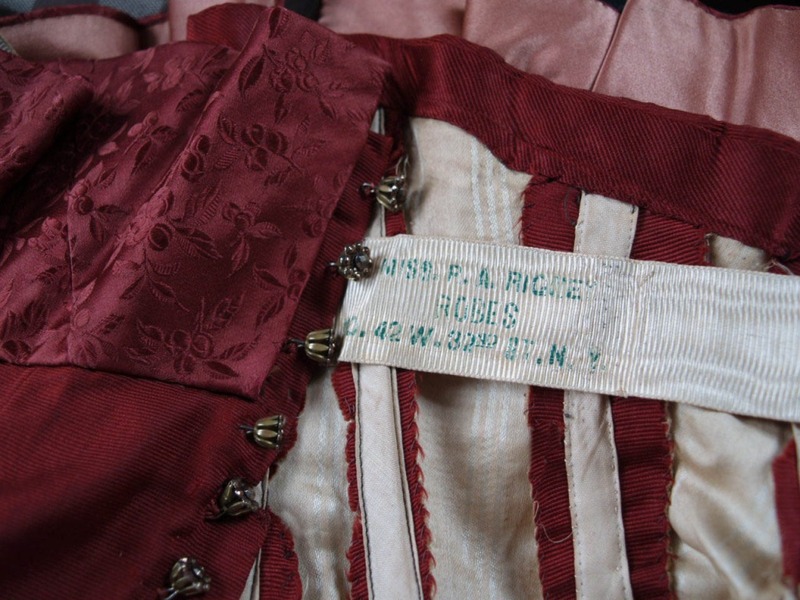 Made by one of the NYC famous dressmakers & inside petersham reads "Miss P.A. Rigne, No. 42 W. 32nd St. NY". 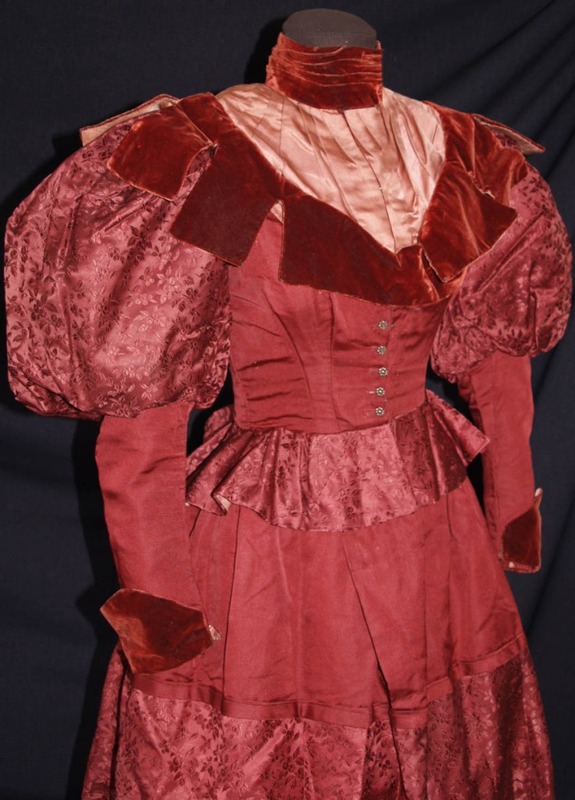 The bodice has a high neckline made from pleated burgandy velvet. The large puffy Leg-O-Mutton sleeves are made of red Brocade in barries motif(see detail pic). 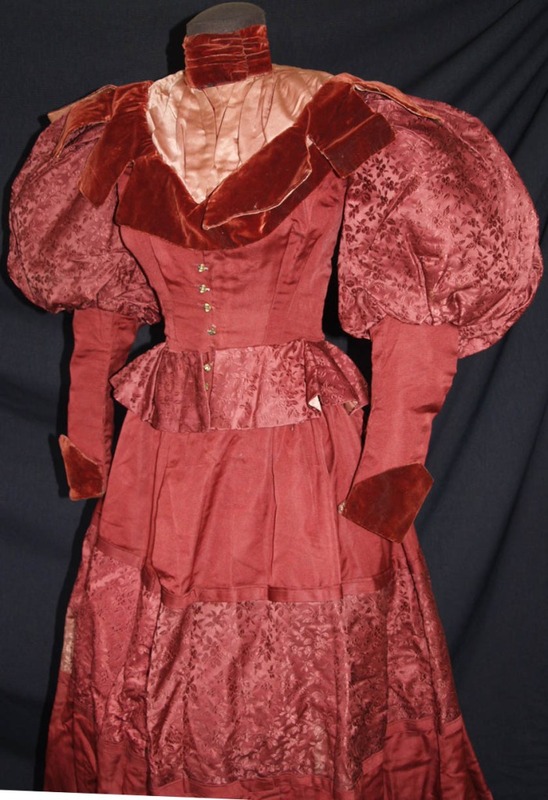 The sleeves are fitted around the elbows and made from red silk faille. The yoke insert is made from pleasing Salmon pink satin. The collar below the yoke is cut in most dramatic patterns(see pic). The red silk faille body is tightly fitted around the waist and flares around the hip. It is made of matching brocade lined with salmon silk. The bodice is made in the Renaissance(Juliet) style with 19-front buttons. The Fancy buttons have cut steel facets & the backs are cone-shape bronze to imitate floral-petals(see pic). The bodice is fully boned & lined with striped cotton blend satin. 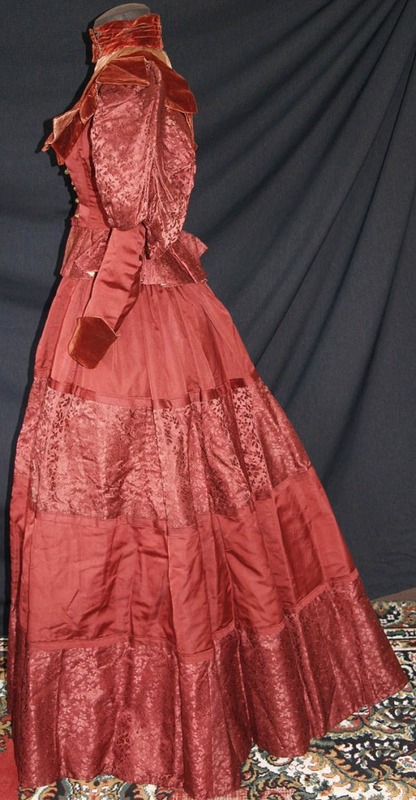 The skirt is made from alternative pattern of red brocade & silk faille. The inside hem of the dress has a large starched ruffle lace which holds the shape of the gored skirt while dancing or walking. The skirt is lined with matching red polished cotton. It has a slight train in the back. I'm interested int he waistline on this one. 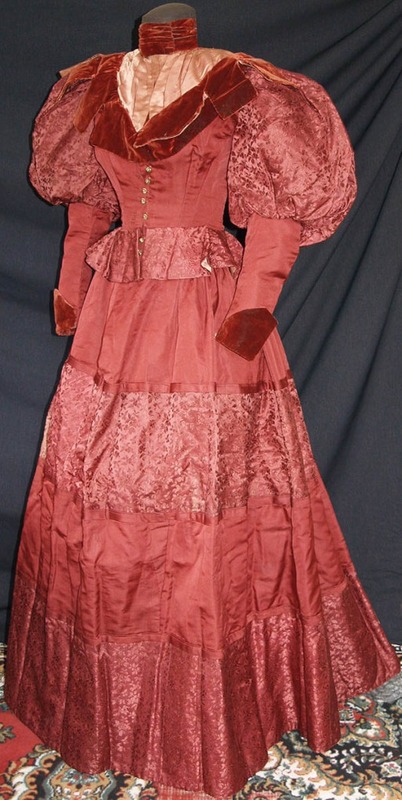 It almost looks like someone took an early 1870's dress and cut it up to make an 1890's dress in the latest style.